The C7th town of Chipping Campden derives its name from the Saxon “Campa-denu” or “Campadene”, meaning a valley with fields or enclosures of cultivated land. Chipping means market. In medieval times Chipping Campden was one of the most important wool towns and was famous throughout Europe. Today, it is a small but beautiful town with a population of about 2,000. The town’s motto on its crest reads History in Stone. The town benefits from long and broad High Street, on either side are continuous terrace showing many different architectural styles. The town’s oldest house belonged to William Grevel, a wealthy wool merchant, who built the house around 1380. This house is the oldest in Chipping Campden and would have been one of the first to have chimneys instead of just holes in the roof. William Grevel was one of the country’s most influential wool merchants, a citizen of London and financier to the King, Richard II. Grevel died in 1401; a brass in honour of him ‘the flower of the wool merchants of all England’ is in St James Church. The Market Hall, built in 1627 cost £90. As usual, the sides were open but the traders had shelter from rain and snow to protect their produce. Sir Baptist Hicks was a generous benefactor to the town, and he built the Market Hall. He also financed the Alms Houses built in 1612. They are still residences for pensioners today. 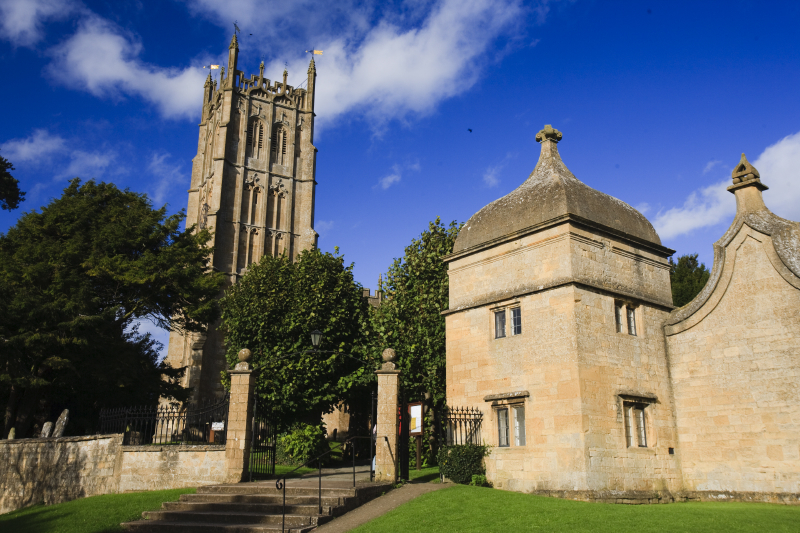 St. James, at the north end of the town, is one of the finest ‘wool’ churches in the Cotswolds, with a magnificent 120ft (36 metre) tower. The church has a pre-reformation altar tapestry and largest brass in England. There is a painted glass window depicting the Last Judgement over the chancel arch. There is also stained glass above the alter. The High Street and much of the town is a Conservation Area. The railway tunnel, built in 1851 by I K Brunel was the subject of controversy. The original builder downed tools and refused to continue work as the Railway owed him a substantial amount of money. Brunel, supported by 2,000 navies, attempted to take over the site, but he didn’t succeed without a fight. The Glocestershire Artillery and the local magistrate attended and the magistrate read the Riot Act. Graham Greene his wife, Vivien, stayed in Chipping Campden at Little Orchard cottage in the 1930s. Here Greene wrote his first successful novel Stamboul Train. C R Ashbee set up his Guild of Handicrafts in the old silk mill in Sheep Street in 1902. This is now a museum.